Connect2Culture & Joplin Convention & Visitors Bureau present second annual Fiddlers on the Route Festival! This will be the second year of the Fiddlers on the Route Festival. Fiddlers on the Route is a festival featuring two days of outstanding musical performances at Joplin’s historic Memorial Hall. Day one features the GRAMMY Award winning bluegrass duo Dailey & Vincent, while day two features an outstanding lineup of the best local and regional bluegrass bands. Grand Ole Opry Members, Five-time GRAMMY® award winners individually, three-time GRAMMY® award nominees collectively, four-time DOVE Award winners, and winners of 35 IBMA Awards altogether (including 3-time IBMA Entertainer of the Year Award winners and 3-Time Vocal Group of the Year Award winners), Jamie Dailey and Darrin Vincent, backed by one of the best bands on tour today, are some of the most reputable and elite entertainers in American music; bluegrass, traditional country and gospel music. Now on Season 3 of their nationally broadcast television series, “The Dailey & Vincent Show on RFD-TV,” Dailey & Vincent bring their music to a national audience on a weekly basis. 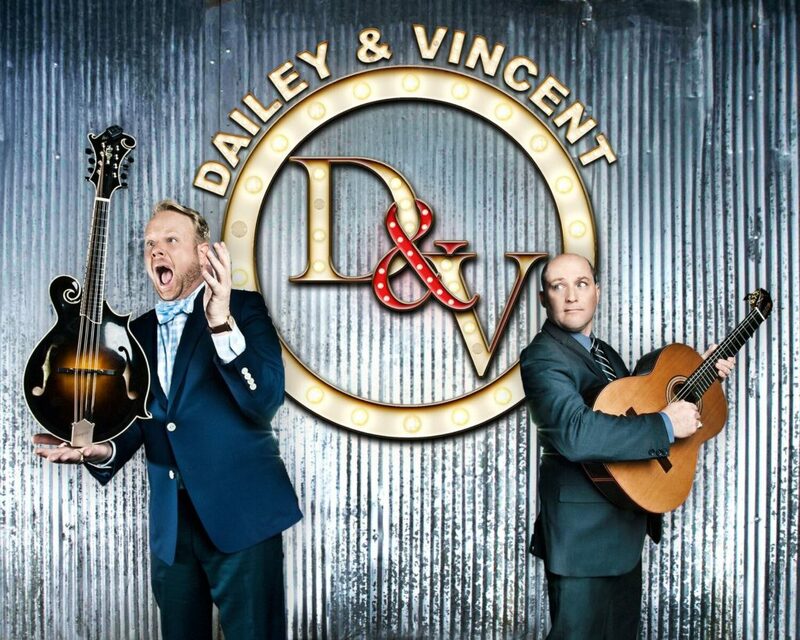 After a decade spent performing together and with over 1,000 airings of their PBS special “Dailey & Vincent ALIVE – In Concert,” their concoction of fantastically instinctive vocal blends of Dailey’s tenor and Vincent’s reedy harmonies has gained them well-deserved praise for their own distinctive style and worldwide recognition as American Music gold. Their most recent live CD, “Dailey & Vincent ALIVE,” debuted at #1 on the Billboard Bluegrass charts and remained at the top position for over 15 weeks. Friday Admission: Floor and Handicap General Admission $25; Mezzanine $20; Balcony $15; children 12 and under admitted free. All ticket prices increase $10 for day-of sales. Tickets may be purchased by going to www.connect2culture.com or by calling 800-514-3849. Come hear some of the best local and regional bluegrass bands in the surrounding area! Saturday Admission: $10 per person wristband for all-day access. Children 12 and under admitted free. Tickets may be purchased at the door. The Pickers Post Band is a Bluegrass group from Southwest Missouri and Southeast Kansas. The group combines the influence of Bluegrass, Country, Gospel and Folk music in their stage performance. Band members are Robert Jones on Bass, Phil Greer on Banjo, Debbie Elbrader, Megan Lamb, and Darryl Anderson on Guitar and Randy Corbin on the Mandolin. Previous performances at Galena Days, The Carl Junction Bluegrass Festival, Neosho Bluegrass Showcase, Pam’s Place Bluegrass Theatre, The Johnson Family Bluegrass Show as well as many other church and other local events Missouri, Kansas and Okla.
Based out of Carthage, Missouri, No Apparent Reason is composed of Rick Rector, Randy Wagner, Travis Wagner, Rick Carneal, and Jim Graham. Always a great time with this band in the house. Serious comedy and hilarious bluegrass! Southern Tradition Bluegrass Band has served the Ozark Mountain area since the group formed in 2014. The band has entertained audiences in Arkansas and beyond as news about their dynamic sound spread. Band members live throughout Northwest Arkansas, and enjoy performing often at regional concerts and festivals. The group’s sound features smooth vocals, three- and four-part harmonies, and instrumental versatility with Jeff Bond and Justin Bond on guitar, Bobby Glenn on mandolin, Rick Evans on upright bass, Isaac Orvin on fiddle, and Tony Langley on banjo and dobro. Sweet Sister Harmony from America’s Heartland. Touring throughout the year in the Midwest, the Vogts Sisters touch the hearts of audiences everywhere they go. The young musicians have garnered numerous awards in regional and international songwriting competitions and have over thirty original songs that fit seamlessly into their acoustic Americana-Folk act, blending timeless music with sweet sister harmony. The Vogts Sisters will soon release their fourth album, Broken Ties, (May 2018) once again, highlighting ten original songs, while exploring the range and dynamics of their maturing harmonies and instrumentation on mandolin, fiddle, and guitar. Other album titles include Homeward (2016), My Own Dixie (2015), and Old Time Noise (2012). A few of their musical influences include Alison Krauss, Emmylou Harris, and Gillian Welch. Brightwater Junction, known for their hard-driving traditional and gospel bluegrass music, was formed in 1996. Based out of Cassville, MO, they play a variety of bluegrass festivals and venues throughout the Midwest and surrounding states. Members include Lyn Coones, banjo and lead vocals, Tonya Coones, bass/vocals, Eric Coones, mandolin/vocals, and Jason Jordan, guitar/lead vocals/songwriter. The band has been nominated for several SPBGMA traditional and instrumental “band of the year” awards, as well as other individual awards with Eric receiving “mandolin player of the year” three times. Most recently, the band won the 2012 Silver Dollar City National Single-Mic championship. Tight three part harmonies, hot pickin’, and a high energy stage show. This is what you get from Borderline Bluegrass. Based in southwest Missouri, this four piece bluegrass band has been entertaining audiences across the country for the last four years. From an early age Julie, Ty, Daniel and Jon all played music in family bands, at music halls, festivals, and hootenannys. Their musical influences are diverse. Country, gospel, jazz, rock, and of course, hard driving Bluegrass, have all come together to create the sound of Borderline Bluegrass. The band has had the opportunity to share the stage with some of the biggest names in Bluegrass music. From regional festivals to their pending debut at the world famous Station Inn, in Nashville, TN, the band is gaining momentum and building their fan base. Their newly released CD project “Family Roots” takes the band down a new path. This project includes nine original tunes, five of which were written by members of the band. You don’t want to miss seeing this up and coming band. When you make it to a show, stop by their table to shake hands and make a friend. “That Dalton Gang” is a versatile group of young musicians. The group centers around the two Dalton sisters, Cheyenne (age 17) and Maddie (age 13) playing twin fiddles and mandolin with astounding professionalism. The sibling harmony vocals will pull you right to the center of every song they perform. Rounding out the group is Alex Clayton (banjo), Wyatt Harmon (bass), and Jimmy Meyer (guitar). Learn more about the members at thatdaltongang.com. This bluegrass/country/gospel band is comprised of Mike Williams (banjo & founding member), Dan Nieto (lead guitar & founding member), Nick Alberty (mandolin), Roger Sparks (fiddle), and Steve Huhn (bass). Dan Nieto: As a founding member of SpringStreet, Dan Nieto is a multi-talented musician and songwriter. Playing lead and rhythm guitar for the band, Dan’s ability to touch your heart with a song is truly a gift from above. As a songwriter, his songs put his faith and Christian values to music in a way that is inspiring. As a guitarist for the band, his tasteful lead work and driving rhythm are always entertaining to watch. Mike Williams: As another founding member, Mike has always had a great passion for bluegrass music. Known for his kindness and easy-going attitude, he has always been a great leader and promoter of the band. As a banjo player, you can count on Mike to work it until it’s right. Not one to settle for something that’s just good; Mike wants to be the best! This shows in his life and qualities. Mike also sings great harmony as well as lead vocals from time to time. Nick Alberty: While his mandolin playing seems smooth and effortless, Nick Alberty also shines while singing as well. His strong lead and harmony vocals have been a great asset to the band. A veteran performer in the area, having performed with several bands simultaneously, Nick is also well known for his songwriting, great rhythm guitar work, and arrangements of material. Steve Huhn: While being the foundation of SpringStreet’s rhythm, Steve has played banjo with the Bluegrass Offenders, and upright bass with Adam Lopez & the Lo Tops. Steve’s classic approach to the upright bass brings the band full circle with a foot-stompin’ rhythm anyone can love.